Official music video for "Human" is here! Official music video for “Human” is here! 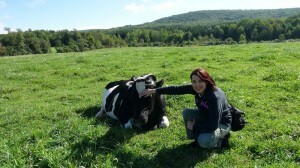 Last September we arrived at Farm Sanctuary in Watkins Glen, NY in the late afternoon. Just before dusk, we introduced ourselves to some of the animals that call the sanctuary home. We stayed in a cabin on the farm, ate awesome vegan food, and the following day we received a guided tour from Farm Sanctuary staff that included some up close and personal time with the animals. Over those two days, we took a lot of video footage that would eventually be used to create the official video for our song “Human.” Approximately nine months have passed since that incredible experience. So why did we wait so long to release the video? Well, besides the fact that it takes a long time to go through all of the great footage we got (so I’m told…Sue deserves all of the credit on this one), we felt a lot of responsibility when putting together this video. While we hope all of our music has a strong message and something in it that people can connect to, we feel like the animal rights movement is a place where our voices matter so much because animals are unable to speak for themselves. We wanted our message to be presented clearly, poignantly, and honestly, with love. I’ve certainly been emotionally moved at animal shelters before, watching the sad eyes of dogs and cats that have been neglected and abused, knowing that thousands of animals are euthanized due to lack of space. 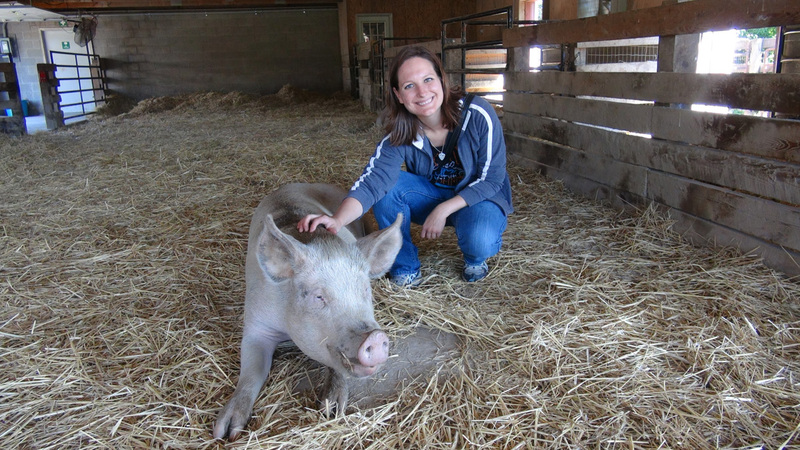 But the experience at Farm Sanctuary was absolutely life-changing in a way that, even as a writer, I struggle to describe within the constraints of written language. 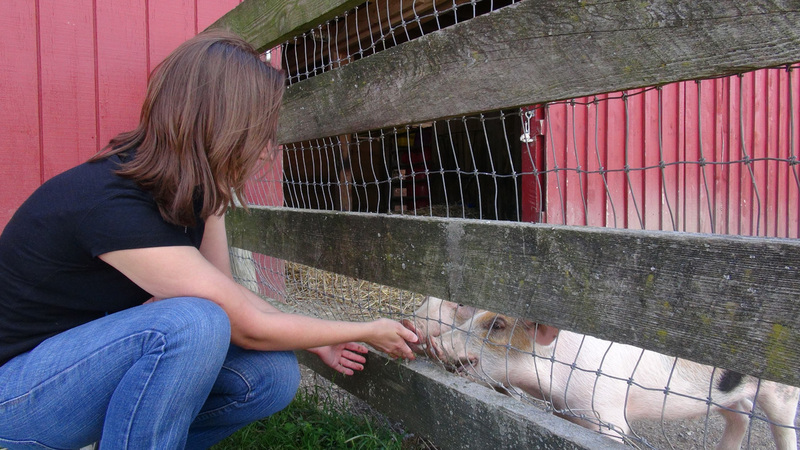 I felt the lump catch in my throat as I scratched the bellies and heads of gentle pigs and watched them delight in human interaction, longing to play and nuzzle and be given treats. What makes them any different than dogs? Certainly not intelligence or ability to feel, both of which pigs possess without question. I connected with large cows, many of whom had been at the edge of death when they had been rescued from deplorable conditions, but now had formed friendships and enjoyed frolicking through the fields. And I came very close to trying to fit a certain goat in the car with us to come be a companion at home, after we locked eyes and he bounded toward me with a gleeful “baaaaa!” before nuzzling my hand just as my cats do. 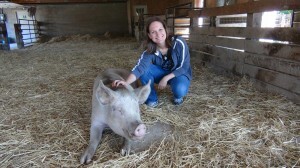 I have been a vegan for nearly three years now and Sue has been one for nearly twenty. I remember viewing veganism as a strange and unattainable thing, not sure if I’d be able to do it or even really want to. But I couldn’t help but eventually realize that we don’t “humanely slaughter” our dogs for food and it’s strange to do so with other animals, that the “happy cows” producing our milk are kept perpetually pregnant while their male calves are turned into veal, that it is standard procedure at even organic and free range farms to dispose of day old male chicks in ways that include asphyxiation or being thrown into a grinder while still alive. First I asked myself, “Why do we treat animals this way?” and soon thereafter made the jump to, “Why even eat animals at all?” This was my personal journey and I share it as such, without judgment. We are all on our own journeys. There are many videos and articles online as well as books that are readily available with comprehensive information on the things I mentioned, but I want this blog to be focused on positivity and how spending time with these animals can truly change lives. It changed mine. This video and this message are extremely personal for both Sue and me because of our deep love and respect for all animals. We invite you to share the video, ask questions, and learn more. We both hope this video will open some eyes as to what a happy farm really looks like. 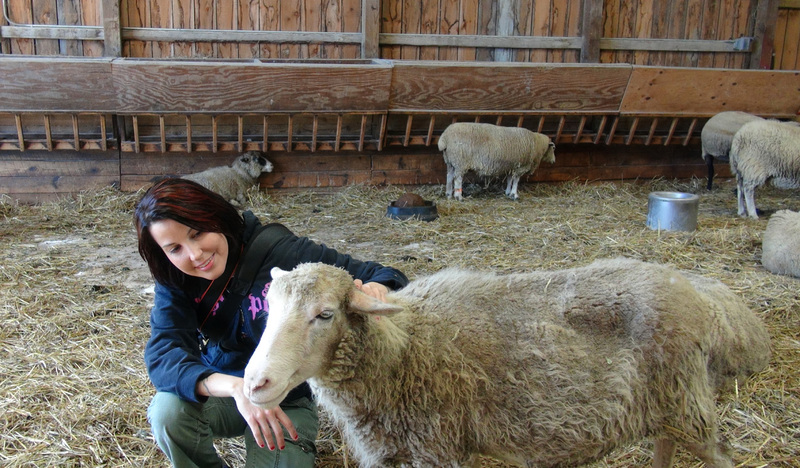 The animals at Farm Sanctuary are treated with dignity and respect and not exploited. These magnificent individuals all have names and personalities and are not being used for anything – meat, milk, eggs, fur – any more than we would use a cat or a dog or a goldfish. Their job is to just be, and be happy. I hope when you watch this video, you share in their joy. We’d like to extend our gratitude to Farm Sanctuary for doing what they do and allowing us to connect with the beautiful individuals we saw there. May we all do our part to make this world a better place for humans and non-humans alike. 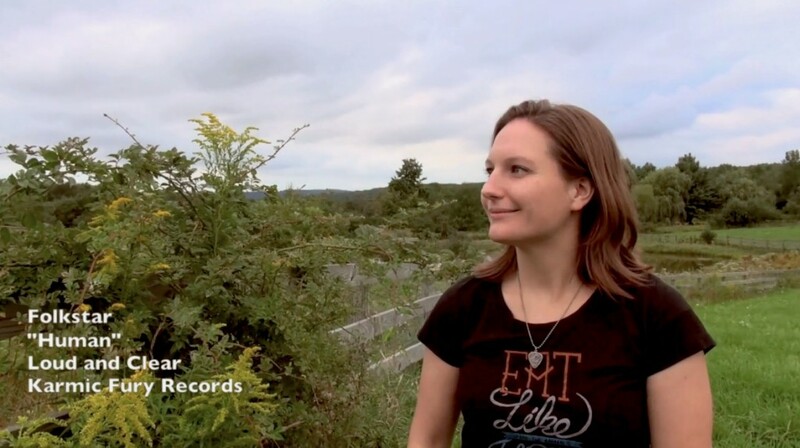 Additional footage by Mercy for Animals: http://mercyforanimals.org. Clothing by Herbivore Clothing: http://herbivoreclothing.com.